Scientists have been peering at microorganisms through microscopes for centuries. For some, the shape of their cells can offer clues to their identity, but it’s often necessary to use stains that tell you a bit more about their cellular structure. Simple stains contain a single dye that can bind to microbial cells and show off their basic structure. Examples of simple stains include crystal violet, safranin, methylene blue, and carbolfuchsin. Differential stains distinguish one type of microbe from another. An example of a differential stain that tells apart Gram-negative from Gram-positive cells is the Gram stain. 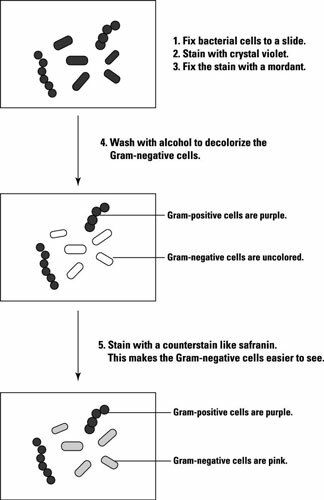 It takes advantage of the fact that Gram-positive bacterial cells have a much thicker cell wall than Gram-negative cells do, which stops them from being washed clean of the first stain by the alcohol-washing step. The acid fast stain takes advantage of the fact that bacteria with a waxy substance in their cell walls will hold onto a stain even after being washed with alcohol. Bacteria that remain colored after washing with alcohol are called acid-fast and include human pathogens from the Mycobacterium group. Other structures in the cell can be observed after being stained with special techniques. These include bacterial capsules, endospores, and flagella.